Today we are talking about Vichy Normaderm Anti-Imperfection Hydrating Care. However at the thermal treatment center in Vichy, France the therapeutic virtues of Vichy Thermal Spa Water on the skin were discovered by Dr. Haller 80 years ago. Love the simple packaging. Love the pump, very hygienic and easy to use. NOTE: The pump is Normaderm Anti-Imperfection Hydrating Care is nearing the end of its lifespan, the pump would get stuck in the bottle. @Vichy, could you please fix this? Not a fan of the smell I must say. Checking the ingredient list again, I can see they hardly use fragrance, which is a benefit. After several attempts to find Vichy Normaderm Anti-Imperfection Hydrating Care useful the best way to get some benefits is after cleansing slather on it, at nights like a mask, is true that feels thick and mask like after this sort of application but sinks in within a minute. The results of the Normaderm Anti-Imperfection Hydrating Care are good. Some acne did disappear after a few weeks. I don’t like the smell at all since the Vichy Normaderm Anti-Imperfection Hydrating Care scent reminds me of glue. The really use a lot of chemicals, but I have to be honest and say most acne-killers do. 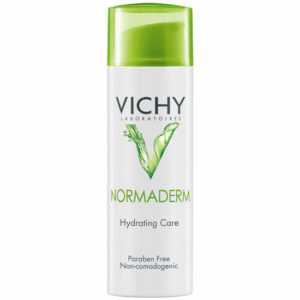 The Vichy Normaderm Anti-Imperfection Hydrating Care retails for about 12 USD which is a great buy. It’s is a good basic cream for you out there who suffer from acne. Normal/combination/oily skin is my recommendation. Would not highly recommend it for dry skin. 3,5 stars of 5. Ingredients: aqua, glycerin, alcohol denat., aluminum starch octenylsuccinate, phenyl trimethicone, isononyl isononanoate, nylon-66, pentaerythrityl tetraethylhexanoate, isopropyl lauroyl sarcosinate, ammonium polyacryldimethyltauramide, sodium hydroxide, glycolic acid, perlite, c12-13 pareth-23, c12-13 pareth-3 ci 42090, glyceryl acrylate/acrylic acid copolymer, isohexadecane, divinyldimethicone/dimethicone copolymer, sodium polyacrylate, poloxamer 338, disodium edta, capryloyl salicylic acid, acrylates/c10-30 alkyl acrylate, crosspolymer, acrylamide/sodium acryloyldimethyltaurate copolymer, polysorbate 80, parfum.